I was innocently searching for portraits of young Queen Victoria in floral headdresses (don’t ask), when I came across this painting on a blog called Wedding Clan: All About Wedding. Now, I don’t expect information on the internet to be always accurate, but I am a bit surprised how off the mark the author of this piece is. 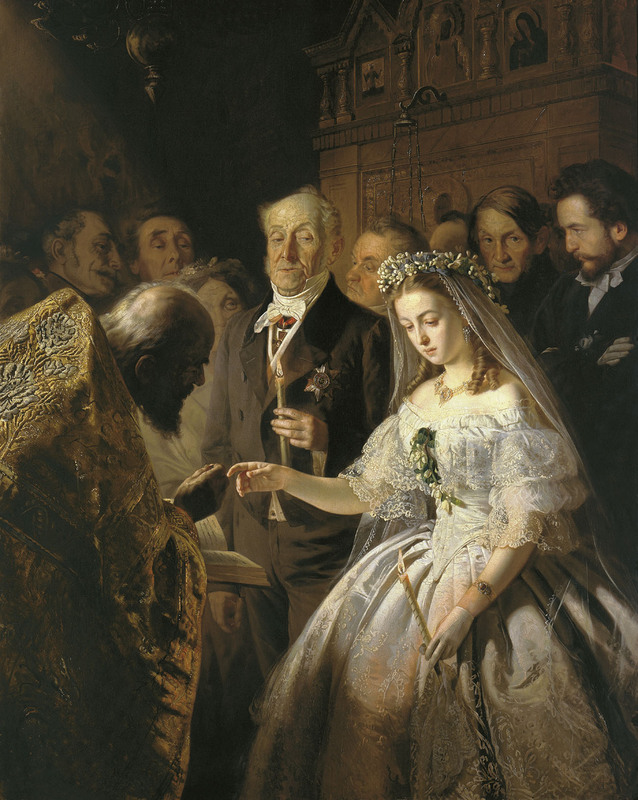 First of all, the painting is called ‘The Unequal Marriage’. It was, in fact, painted by Vasily Pukirev in 1862. However, the ‘elderly gentleman’ as the writer over at Wedding Clan so aptly calls him, is not the bride’s father, he is the groom. That’s why it’s called an ‘unequal marriage’. The ’emotions’, that supposedly ‘play across her pale face’ are not hard to decipher. It’s despondency and resignation to her fate. The man standing behind the bride, with his arms crossed, who looks like a poet or a young revolutionary, is her sweetheart. Pukirev’s painting is a work of social criticism. He attacks the unequal status of women in Russia and society’s lust for money and power at the expense of individual’s happiness. We like to think of marriage as a union of two loving people, who on that special day celebrate their life-long commitment to each other. But we shouldn’t forget that for most of history that was not the case. Marriage has been a contract that allowed for transferal of goods and property (and women were property, formally or informally) from one family to another. It was a way to secure status and wealth, make alliances, and ensure the continuation of your line with property inherited by legitimate heirs. I don’t mean to say that a somewhat unsavory history of marriage should mar anyone’s wedding day. Like all institutions marriage has changed and evolved to suit the needs and priorities of the contemporary society. What I do object to, however, is the blind belief in marriage as this monolithic structure and that any change to the institution would bring about its immediate destruction. There is no reason why we shouldn’t redefine marriage. We’ve been doing it for ages! And mostly for the better. The expression ‘traditional marriage’ is especially jarring because it overlooks the fact that marriage has not always been the same and did not mean the same thing to all people in one place at any one given time. Works of art, literature, historical documents, diaries and letters remind us that marriage has not always been a pretty thing. There are plenty of compelling arguments for redefining marriage that have already been voiced many times by supporters of marriage equality. I will just add that looking at the painting above, I’m pretty darn glad that marriage has been redefined since the 19th century. What Do I Call My Blog?